As the standard bearer for the Android Wear 2.0 launch, LG’s sport watch suffers from very narrow appeal. Can Google's new watches save Android Wear? 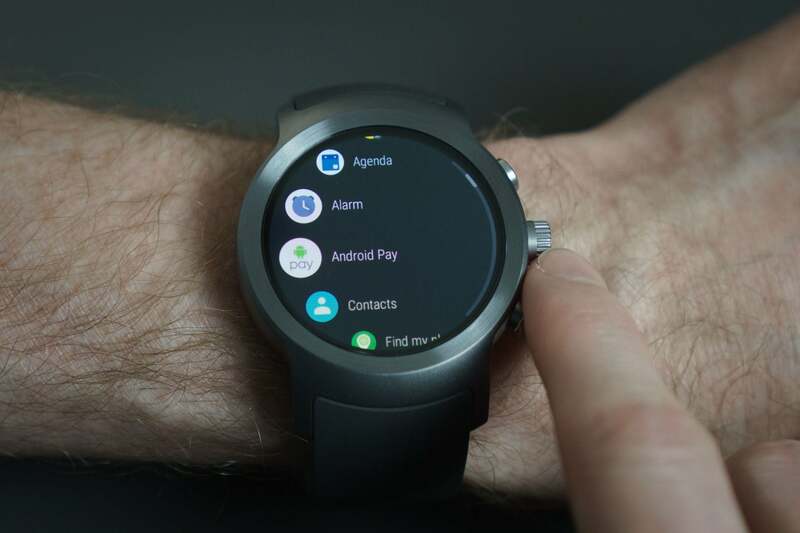 Android Wear has a problem. Sales are slow. Motorola is backing out. Samsung has its own watch platform. 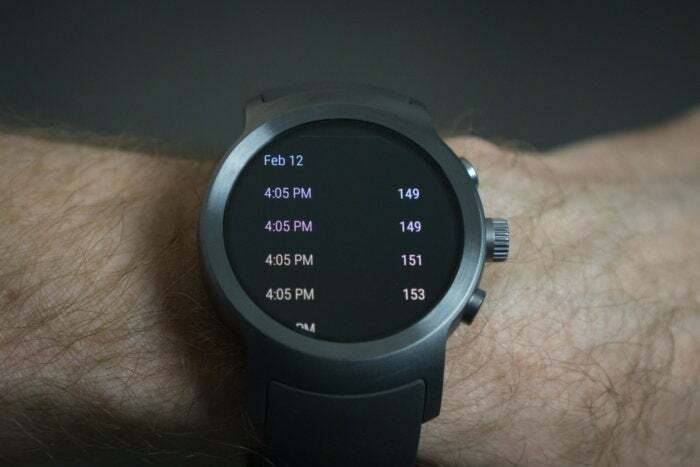 What Google’s watch ecosystem needs is a reboot. New software, new hardware, fresh marketing, the works. Unfortunately, the two LG watches chosen to be the launch partners for the new Android Wear 2.0 platform fall well short of the fresh, forward-looking, “gotta have it” hardware that’s really needed. The LG Style is missing some of Wear 2.0’s best features, and the LG Sport, which showcases everything Wear 2.0 has to offer, is laden with faults. Android Wear 2.0 includes a host of welcome improvements. While numerous watches will be upgraded to the new OS, there are only two that have it now, and the LG Watch Sport is the only one that has the entire feature set. 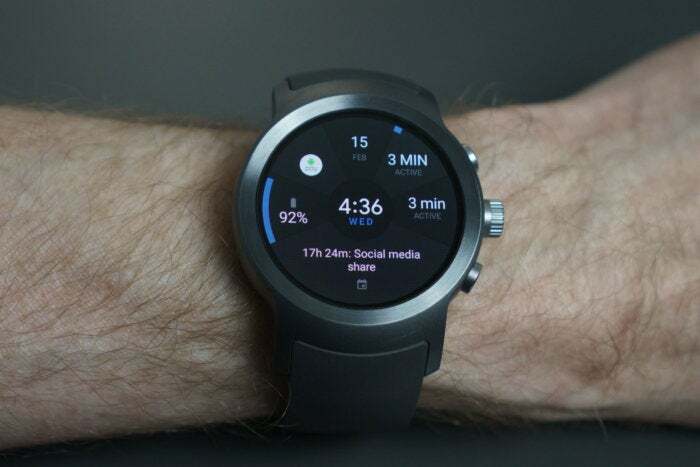 The Style doesn’t have a heart rate monitor, support for Android Pay, its own cellular connection or GPS. The Sport has all that stuff. It’s got a sizable 1.38-inch POLED display with a 480x480 resolution, and it looks great. It’s bright, crisp, and easy to read in sunlight. The 430 mAh battery provides impressive battery life. I was easily able to make it through the day with typical use, including an hour-long gym workout, though those who rely heavily on unethered cellular operation and extended heart-rate tracking may find themselves running out of juice before bedtime. But as with most smartwatches, it’s still a charge-every-night device. Oh my god, Becky. Look at his watch! It’s just so…big! The problem is that it’s just so big. There’s “men’s watch” big and then there’s “this is a diving watch” big. This is the latter. Even people who like large watches will likely find the case size, thickness, and weight a little bit much. I’m a tall guy at 6’4”, but with relatively thin wrists. 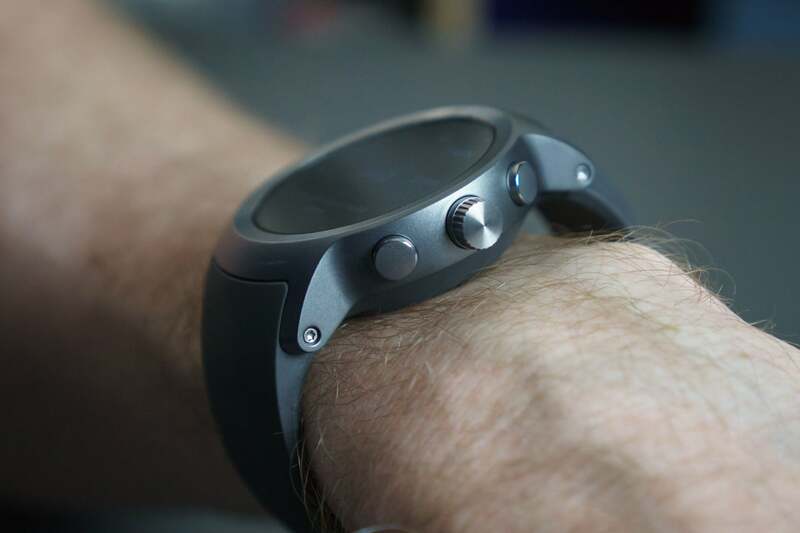 The LG Watch Sport was so big that it simply didn’t fit comfortably; the rigid curves of the bands extend too far to the edges of my wrists. It made me feel like a toddler trying to wear daddy’s big watch. If a watch doesn’t even fit me properly, I can’t conceive of the women I work with daring to put it on every day. The rotating crown is a great addition that meshes nicely with Android Wear 2.0’s interface update. I have to wonder if the Qualcomm Snapdragon 2100 is somewhat at fault here. This system-on-chip was expressly designed for wearables, but it’s still built on a 28nm manufacturing process—and that’s two generations behind the process tech that Qualcomm uses for its latest smartphone chips. This makes the 2100 affordable, but also much larger and more power-hungry that it would otherwise be. Would a 14nm version of this chip allow for smaller internal circuitry? Would it get more life out of a smaller battery? These are relevant question if you’re concerned about the size of your monstrous watch. We’ve written at length about the new features in Android Wear 2.0, and the LG Watch Sport is effectively a “Nexus” device for the platform, without custom LG features all over the place. That’s just fine. Using Android Pay to buy things with your watch is neat. Tracking runs while leaving your phone at home...very cool. But if you like to work out, the new Wear platform is especially appealing. Google Fit’s new exercize tracking is fantastic. It even auto-recognizes lots of strength training exercises and counts reps! The new Google Fit in Wear 2.0 is a fantastic workout buddy. It now includes a lot more activities, and tracks them fairly accurately, including continuous heart rate monitoring for cardio activities. But it’s the ability to track strength training exercises that really blew me away. Just say you’re starting a strength training workout, and the watch will try to guess what exercise you’re doing, as well as count reps. I found it shockingly accurate. It correctly distinguished between pull-ups and lat pull-downs. It knew when I was doing bench press versus overhead press. Yes, there were a few missed guesses among dozens of activities across multiple workouts, but it’s a simple matter to tap the wrongly-guess exercise and pick the correct one. It also missed rep counts sometimes (by no more than one rep), but both exercise tracking and reps counting got more accurate over time. You get continuous heart-rate tracking during cardio activities, though it just floods your heart rate history. The ability to simply tap “start” and then enter in the amount of weight you were lifting at the end is an incredible boon to those who want to track their workouts. It even correctly recognized when I switched exercises and let me back-fill multiple different sets at once. At the end of my workout, I could hop on the stationary bike and start a cardio session with continuous heart-rate tracking. As a gym buddy, if you can get past the clunky size and weight of the thing, the LG Watch Sport is a fantastic companion. Android Wear 2.0 is a really significant upgrade that rectifies a lot of the platform’s shortcomings. Now it just needs a great watch to accompany it—something that nails the intersection between sporty and classy, fashion and fitness. 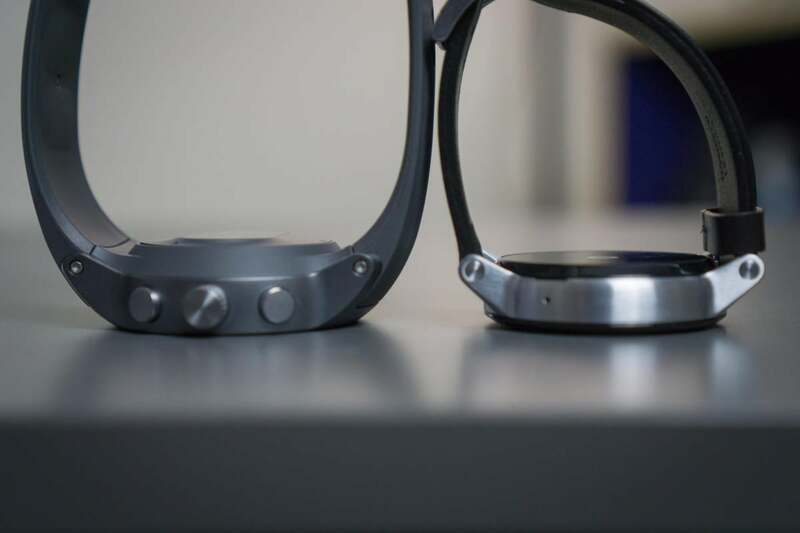 I don’t want to harp on it, but look how much larger and thicker the LG Sport is than the Moto 360 v2 (right). The LG Sport is not even remotely close to beinng that watch. Sure, you can opt for the LG Style instead, but then you give up Android Pay, heart-rate tracking, and GPS. Even if you consider it entirely for what it is—a masculine watch made for large-wristed workout enthusiasts—it has significant problems. It’s still too large, thick, and heavy to run with comfortably. It’s not especially good looking. It has some interface issues…there’s no clear way to change the function of the two buttons on either side of the crown, should you find that Google Fit and Android Pay are not the most useful apps for them to launch. The elastomer (read: plastic) band feels cheap, and it’s not replaceable. There’s also too much bezel around the display. I like the idea of a charging cradle (similar to that of the Moto 360), only LG’s looks and feels cheap. The LG Watch Sport just looks and feels like a “gadget” and not a “watch.” It harkens back to the days of those old Microsoft Spot watches (remember those?). 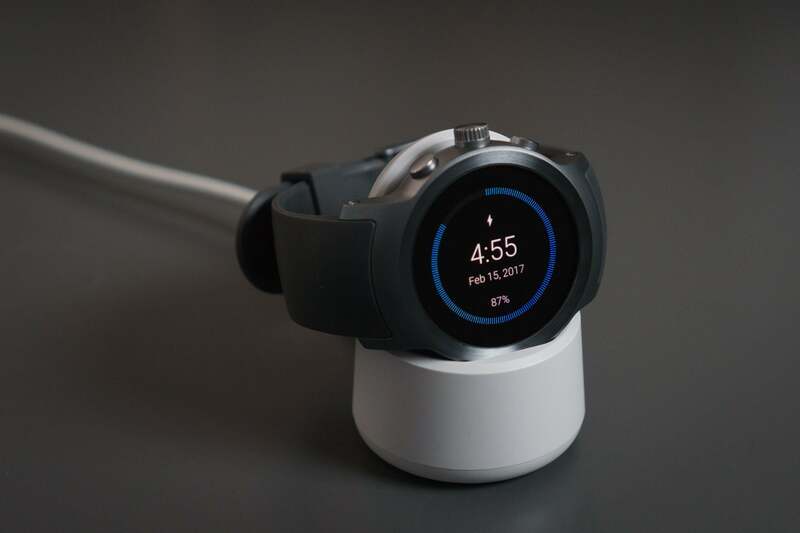 Instead of reaching as broad a market as possible with the first full-featured Android Wear 2.0 watch, LG and Google have given us something with almost impossibly narrow appeal. This watch is almost exclusively for large-wristed athletic types whose fashion sense leans toward calculator watches. I found myself wanting to put it on just before I left for the gym, and itching to take it off the moment I got home. Android Wear 2.0 deserves a better showcase watch than this. With any luck, another manufacturer will step in with a more universally acceptable design that at least supports Android Pay and has a heart-rate monitor. It’s a shame that the debut watch to carry the full Wear 2.0 feature has such compromised ergonomics and aesthetics.